Here is the video I promised of me beating the level. I'm sorry but I had to speed it up by 2X because my account isn't verified and the original was too long. I did make a lot of stupid mistakes but there were times where some attacks stopped working. A good example of this is at the end at the boss battle. Sorry for being terrible at your game. 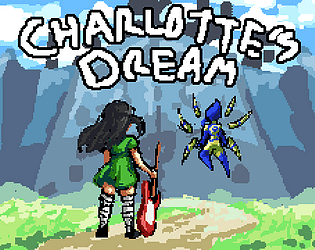 I love the music and the main character Charlotte is adorable. It was hard for me to get used to the controls at first but as soon as I did everything felt intuitive. My main problem was pressing X+UP trying to do the jump attack when I should of been pressing Z+UP but it didn't take me too long to get used to it. For this game I think making you die every time you fall into the water might be a little harsh, the difficulty is already there without that instantly killing you. In my opinion taking away some HP and putting you back on dry land would feel a little more fair. That being said the way you have it setup might be fine and I just need to git gud. Either way you're doing a great job and I can't wait to play it when you're done.